This year's Middle Of The Map Fest kicked off Thursday evening. One of the first acts to play was R&B singer-songwriter Anna Wise. 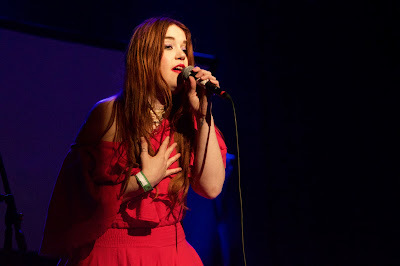 Well-known for her collaborations with Kendrick Lamar and her work in her band Sonnymoon, Wise performed a half hour set at Madrid Theatre that she mentioned was "more artistic" than her usual. She began her set by creating a melody with her table full of drum machines and pedals and slowly adhering her vocals to it. Wise's vocals -- as her fans know by now -- are capable of reaching stunning, angelic levels. Her performance grew static and sleepy at times, but Wise was quick to wake up the crowd with interesting tidbits about her songs or by leaving the stage for a "dance party" in the crowd. Following Wise at Madrid was Zipper Club. Based in Los Angeles and featuring Mason James of NYC punk band Cerebral Ballzy, the group formed last year and is yet to release an album. The trio's trendy wardrobe selections seemed to go hand in hand with its sound. Zipper Club's half hour set was made up of bouncy new wave tunes filtered through the radio indie pop sound made popular by bands like The 1975 and Alt-J. No songs were particularly dreadful, but there was nothing too remarkable besides the band's consistent energy. One of the several bands to play at The Riot Room on Thursday night included The Philistines. The Kansas City sextet welcomed a new bass player during its set and played an electric and freewheeling brand of bluesy psych rock. Los Angeles' Mr. Elevator took the stage after The Philistines. Mr. Elevator performed a different take on the subgenre of psych rock, offering up dreamy, synth-heavy adventures comparable to The Beatles' most colorful tracks. The turnout wasn't particularly heavy, but the folks that did show up seemed to be enjoying themselves.